If you know someone who was an early Texas artist, you could be the key to preserving a valuable part of Texas art history. 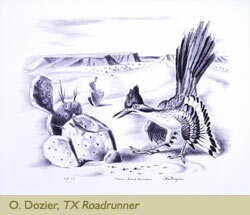 It is vital that the life and works of early Texas artists are documented. You can work with CASETA to donate archival material to an institution that will collect, organize and make it available to scholars, researchers, educators and others who will help preserve this important part of Texas history. Archival material is sought for those artists who worked in Texas 40 years prior to the present date. There are more than 4,000 such individuals across the state. Letters, exhibition catalogs, newspaper articles, photographs, diaries and other documents pertaining to the life and work of an Early Texas artist. Contact Howard Taylor or Valerie Bluthardt at caseta@samfa.org. Discuss the material you have and your interest in disposition and we will refer you to the appropriate institution. Some institutions have a statewide interest and others are interested in artists from a specific region of Texas. Each institution reserves the right to determine what material will be accepted. An institution may require that the gift be unrestricted and in some cases be appraised before a donation is accepted.